Bake Pillsbury™ crescent dinner rolls according to package. Let cool. In a large bowl, whisk together the cream, sugar, eggs, peanut butter, and vanilla until fully incorporated. Spray a 12 cup muffin pan with baking spray. Tear up the crescent rolls, one roll for each hole. Then tear the remaining four rolls and divide evenly among the cups. Slowly pour some of the custard mixture over the crescent rolls. Gently press crescent rolls down in the muffin pan, making sure to soak up the custard mixture. After that there should be more room for more custard. Place a heaping tablespoon of jelly on top of each bread pudding. Place the muffin pan into a large baking dish and fill with about an inch of water to create a water bath. Carefully put into a preheated 350°F oven. Bake for 20-25 minutes or until no liquid comes up when you push down on the bread puddings. Remove from water bath and let cool on a wire rack for 20 minutes. Run a knife around the sides of each pudding to make it easier to remove them. Heat up the remaining jelly and use as a sauce for the bottom of each pudding. Add chopped peanuts, if desired. Peanut Butter and Jelly… absolutely one of the best combinations of all time and the original savory and sweet combo. April 2nd is the day to celebrate that… Peanut Butter and Jelly Day. 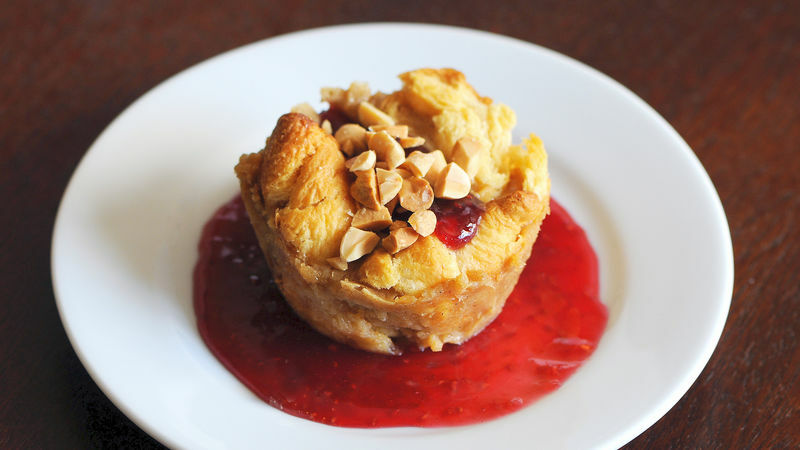 Now when I was a kid, I celebrated this day every school day by taking a PB&J to school and while I will still happily eat a PB&J sandwich, I thought I would celebrate the official day with a spin on my favorite dessert with Peanut Butter and Jelly Bread Pudding Cupcakes. Bake Pillsbury Crescent rolls according to package. Let cool. In a large bowl whisk together the cream, sugar, eggs, peanut butter, and vanilla until fully incorporated. Spray a 12 cup muffin pan with baking spray. Tear up the crescent rolls, one roll for each hole. Then tear the remaining four rolls and divide evenly among the cups. Slowly pour some of the custard mixture over the crescent rolls. Gently press crescent rolls down in the muffin pan, making sure they soak up the custard mixture. Then there should be more room for more custard. Place a heaping tablespoon of jelly on top of each bread pudding. Place the muffin pan into a large baking dish and fill with about an inch of water to create a water bath. Carefully put into a preheated 350F oven. Bake for 20-25 minutes or until no liquid comes up when you push down on the bread puddings. Remove from the water bath and let cool on a wire rack for 20 minutes. Run a knife around the sides of each pudding to make it easier to remove them. Peabody loves ice hockey (she plays!) and all things baking! Check out her great stuff at her blog site Culinary Concoctions by Peabody and her Tablespoon profile. There are plenty of options to choose from to celebrate all that is peanut butter and jelly!